The Benefits of Ginger | Delicious in Food With Numerous Health Uses! While we certainly get to appreciate the tasty benefits of ginger when we're making our puddings, desserts and stir frys, like all spices and herbs, what may not be commonly known is how many health and well-being uses it has. Certainly, everyone who has ever sipped a glass of ginger ale to ease an upset tummy can attest to its healing abilities. For thousands of years, traditional medicine has used it, fresh and dried, to alleviate any number of symptoms and conditions. ...from diarrhoea and heartburn, to food poisoning, sea sickness and nausea. But aside from upset stomachs, there are other ways that it can help the digestive system. 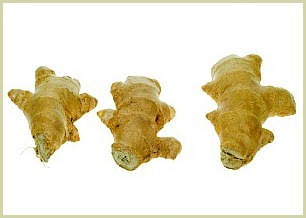 Researchers at the University of Minnesota have found that ginger root can slow the growth of colorectal cancer cells. As well, a new study out of the University of Michigan is showing that it may hold enormous promise in the treatment of ovarian cancer. They found the ground powder caused cancer cells to die out quickly in a condition that is difficult to treat, and all too often deadly. These are just a few of the exciting health uses that we currently know about. And ongoing studies are discovering more all the time! So, whether you take it in capsule form, use the essential oils or eat it fresh, the benefits of ginger are so varied and so plentiful, it just makes sense to have plenty of the fresh root or ground spice handy. If you're thinking of growing some, click for my tips. If you do want more of this in your daily diet, I highly recommend making a drink from the grated root. Click here for my simple ginger tea recipe.